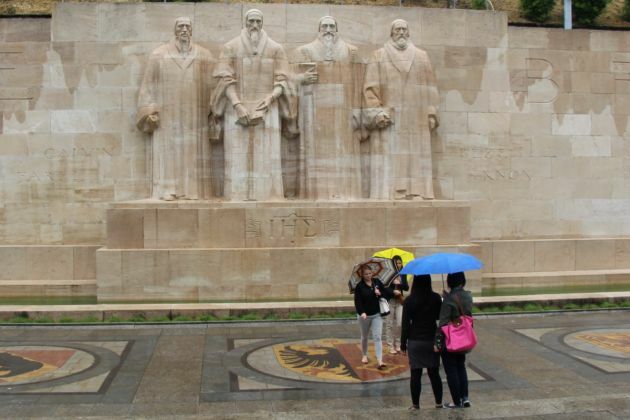 "The awareness is dawning on Lutherans and Catholics that the struggle of the 16th century is over," the report said. "The reasons for mutually condemning each other's faith have fallen by the wayside." "The true success of the Reformation can only be achieved through the overcoming of our inherited divisions in a renewed Church consisting of all Christians, and that consequently our ecumenical efforts aimed at recovering unity are actually a completion of the work of the Reformation itself," Koch said. (Photo: Ecumenical News / Peter Kenny)Lutheran World Federation General Secretary, Rev. 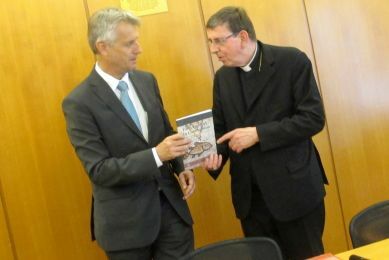 Martin Junge and Cardinal Kurt Koch, President of the Pontifical Council for Promoting Christian Unity, with the shared Catholic-Lutheran publication on the Reformaton, From Conflict to Communion in Geneva on June 17, 2013. "We, for example, cannot impose papacy on you; and I can expect from you not to push us to Eucharistic hospitality [shared holy communion] and church community as these are constitutive questions for the theological basis of our faith." "Now we have been able to see that Martin Luther wanted a renewal of the Church and not a new Church," the Catholic representative said. LWF President Bishop Munib A. Younan noted in a speech, "It is my sense that this document can be an important tool in improving relationships and, more importantly, common witness, in all contexts." Younan observed, "Through the centuries, we have engaged in violent conflict with one another. More often, however, we have failed to abide by the Eighth Commandment [Thou shalt not bear false witness against thy neighbour] and have borne false witness about one another. "Now, as we approach the 500th anniversary of the moment that sparked the Reformation, 'From Conflict to Communion' provides an opportunity to reflect on our particular history - now worded jointly by Lutherans and Roman Catholics - so we can correct our behavior and engage one another more constructively for the sake of God's mission." "Above all, the document seeks to address difficult points in the history of Lutheran-Roman Catholic relations so we can deepen our relationships globally and get on with the work of jointly participating in God's mission for the sake of the world." "None of us can alone decide how to build unity. We have other sisters and brothers on the same road. We need profound and sound theological work," said Huovinen.